Fifty years after John Lennon and Yoko Ono famously staged a honeymoon “bed-in” for peace in an Amsterdam hotel, a Dutchman has unearthed 30 minutes of colour footage of the event from his cellar. 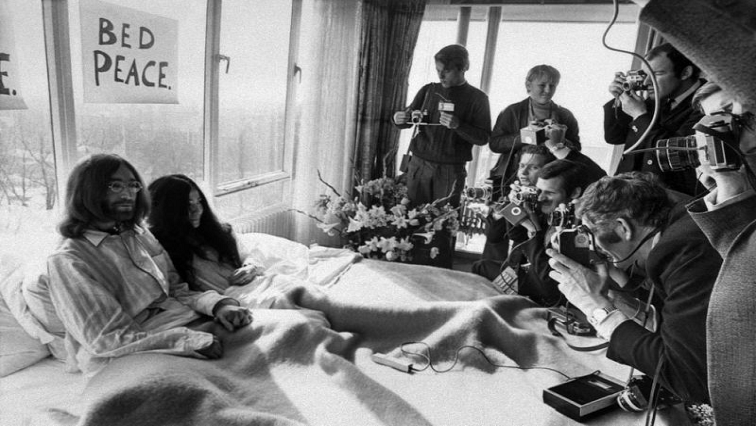 The couple spent a week mostly under the sheets at the Hilton hotel to spread a pacifist message; smoking, eating, singing and playing guitar while receiving journalists for interviews. The European leg of their honeymoon, which included an unusual press conference in Vienna with the glamour pair obscured inside a giant “bag,” was a huge media event, each step captured by photographers and videographers. This included a Dutch team shooting footage for a two-part, 84-minute documentary, a kind of video diary filmed at the pair’s request. It was broadcast only once, shortly after the honeymoon, and shown at the Edinburgh Film Festival the same year before disappearing into the archives of broadcaster KRO, where Jan Hovers was employed in the 1980s. During a major clean-up of used film reels, he stumbled upon a tin marked: “Mr & Mrs Lennon’s Honeymoon” among others earmarked for the rubbish heap. As Amsterdam marks the 50th anniversary of the unusual honeymoon, a former colleague remembered that Hovers had once mentioned the find to him. The colleague “knocked on the door and said: ‘Didn’t you have a film of John and Yoko from the time?’ Only then did I fetch it from the cellar,” Hovers said. The footage, parts of it broadcast by Nieuwsuur, shows the couple in long, white pyjamas in their bed on different days, with two large posters reading “Hair Peace” and “Bed Peace” sellotaped to the hotel window behind them. In one part, Lennon is sitting in bed playing guitar as Ono looks on, in one they are eating, and in another we see the pair from the back, sitting up the bed as they switch off the light to go to sleep. After their Amsterdam sojourn, the couple flew to Vienna for a press conference where they spoke to reporters from within a large bag. Footage of their plane journey to the Austrian capital is on the tape, including some of the press scrums the pair was constantly confronted with. The post Unknown footage of John Lennon, Yoko Ono resurfaces after 50 years appeared first on SABC News – Breaking news, special reports, world, business, sport coverage of all South African current events. Africa's news leader..